Yesterday it snowed. Hazel was so excited. 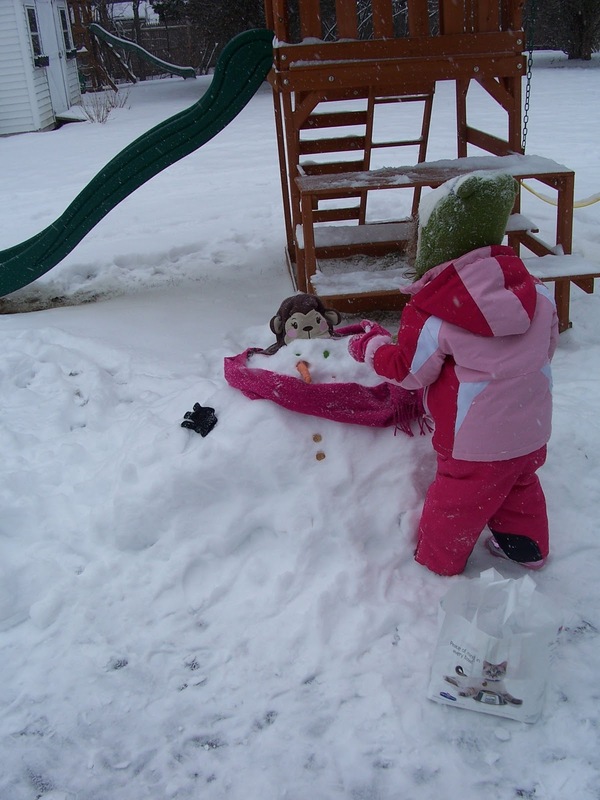 She has been asking since October to build a snowman. 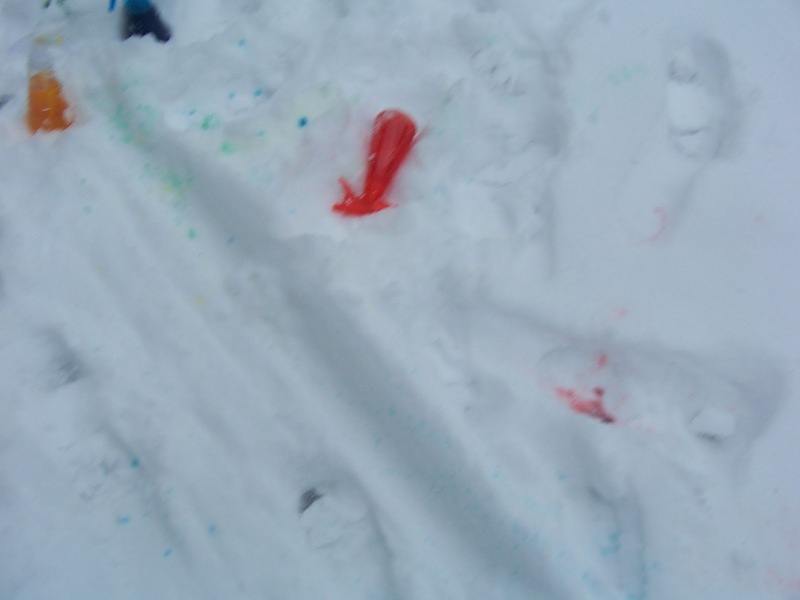 Of course, just our luck we are healthy enough to go out and play and get enough snow and of course it is a dry snow, but we made due. 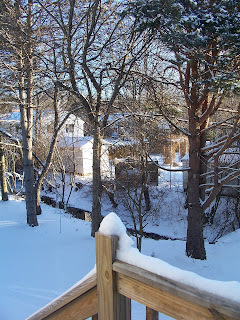 Above is a picture of part of our back yard. 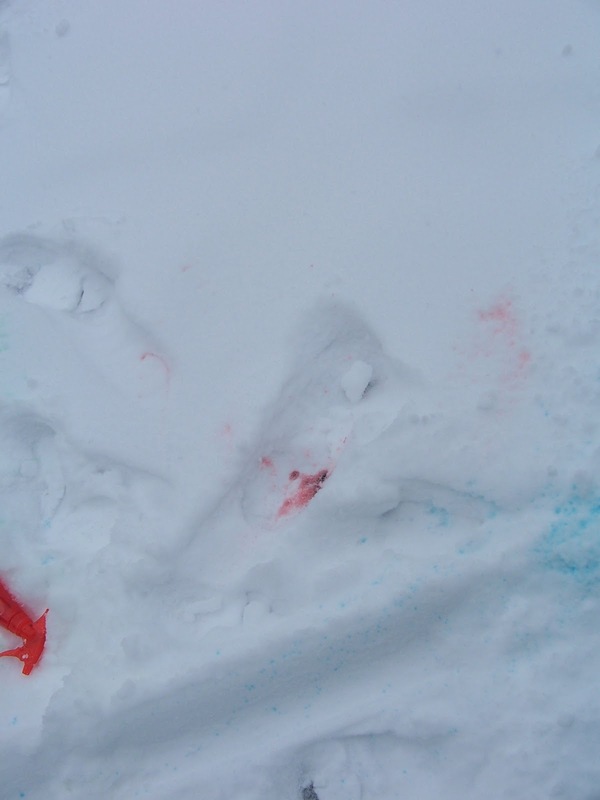 You can see the tracks where I pulled her on her sled. 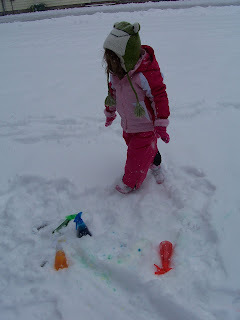 The night before I made the squirt bottles of colored water for her to paint in the snow. They only worked a bit. Guess I should have invested in better bottles. But she did have fun. She even tried mixing colors because she wanted orange. 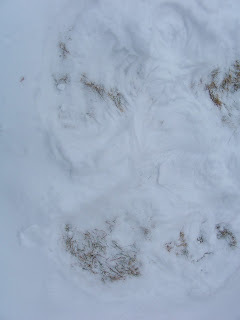 Hazel also made her first snow angel. We have been reading lots of books about snow, so wanted to do everything she saw in the books--make tracks in the snow, snowball fight, make a fort, make a snowman, catch snowflakes and make snow angels. 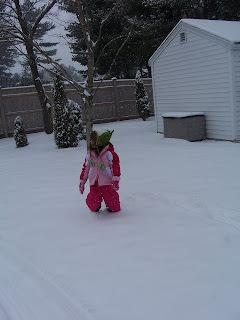 Then she pulled out her shovel (her garden shovel) so she could help Daddy shovel. 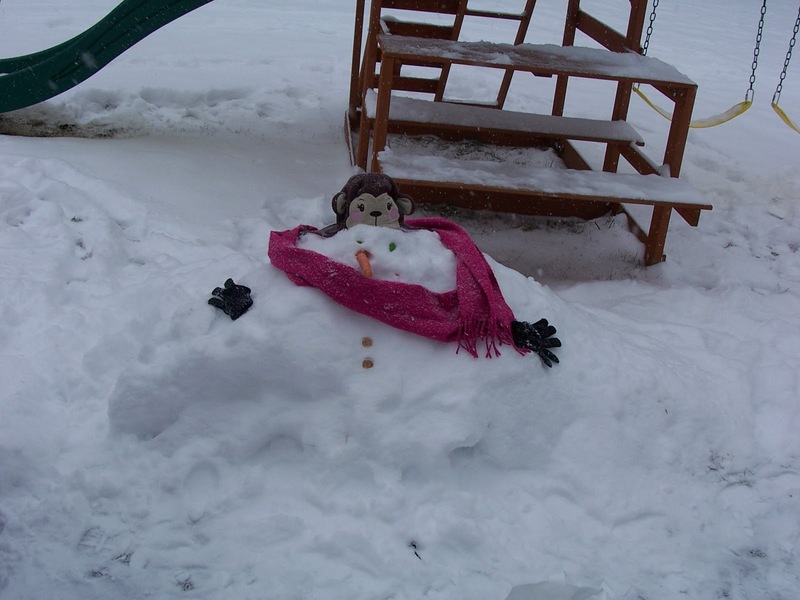 She was shoveling the grass, but we didn't stop her. She also tried some more painting and color mixing. And made her second snow angel in the front yard--good thing since Daddy shoveled away her first one. Next Hazel pulled Mommy in the sled. 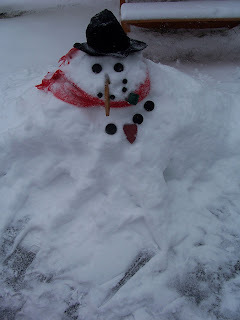 I helped with my hands. We didn't get a picture since Daddy was off shoveling and clearing all the exits to our house to keep us safe. Then I pulled her around the back yard. I love our back yard. 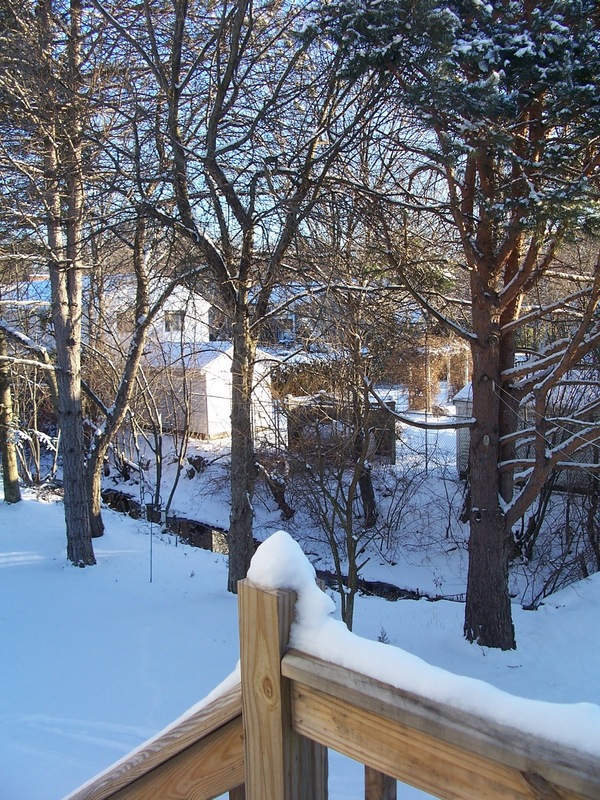 You can see the creek in this picture that goes around the back and side of our back yard. 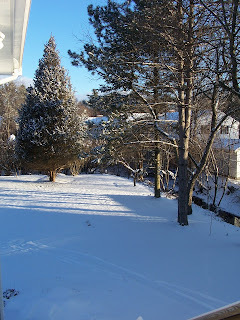 I took the back yard shots this morning, but the snow is still covering everything. Then Hazel wanted to walk and make tracks. 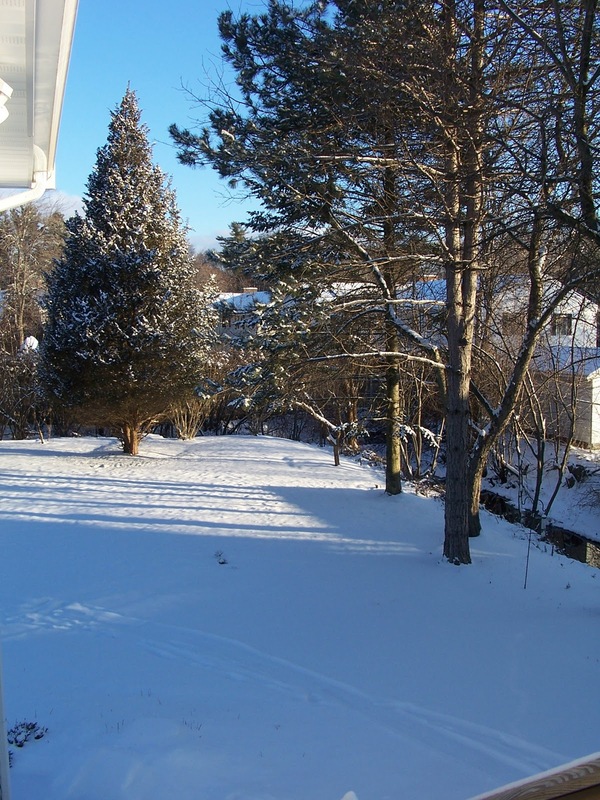 This is another part of our back yard. 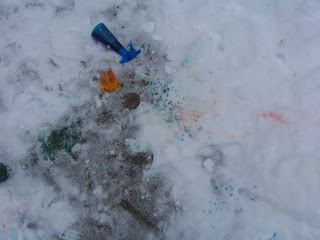 Then we pulled out some black felt and a magnifying glass to catch snowflakes and check them out. This didn't last too long since our magnifier wasn't strong enough and we were catching too many with how fast it was falling. Sorry I didn't get a good picture of it. Then Hazel wanted to build a snowman. 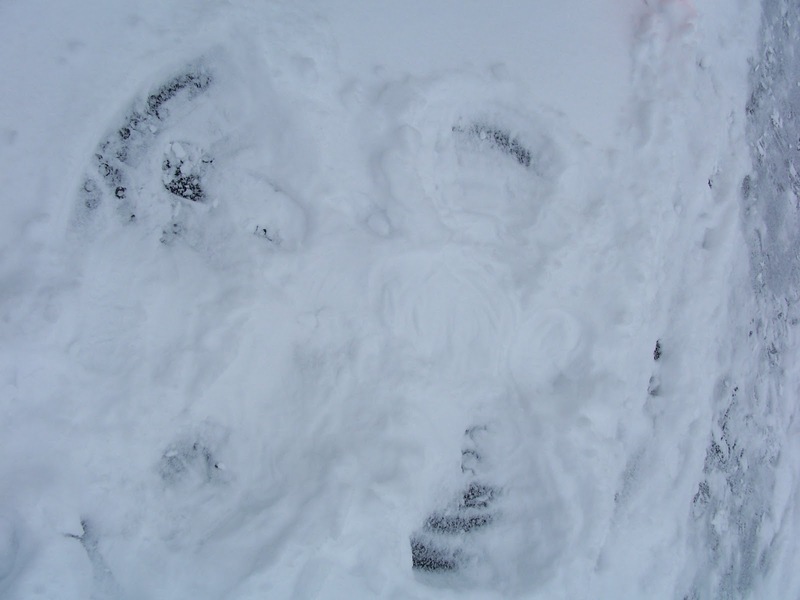 So Daddy shoveled away her snow angel and that part of the driveway and made a big pile for her. 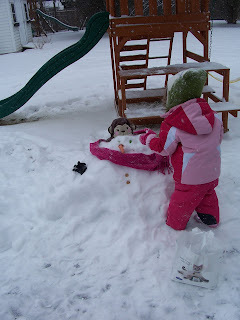 Then we pulled out the snowman decorating kit someone gave us for her second birthday and tah dah! 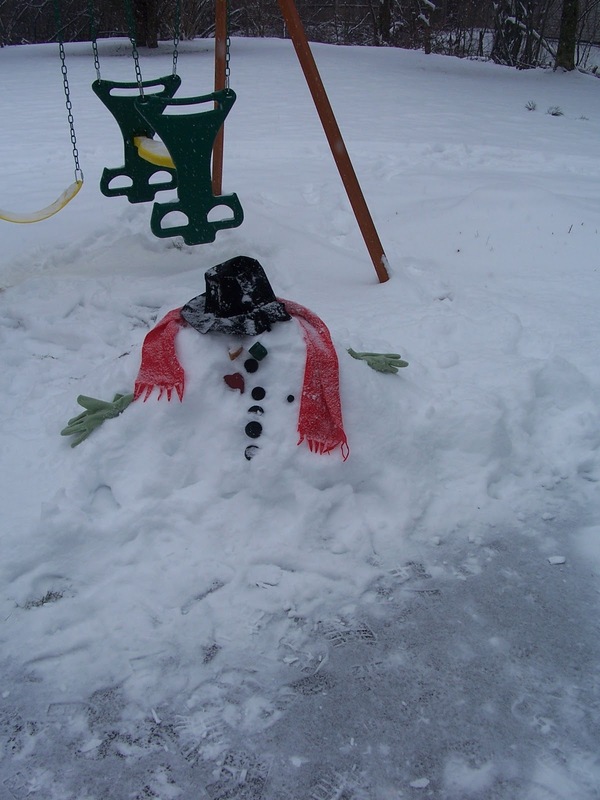 We have a snowman--sort of. Then of course she wanted to build another one. I went inside to look for more decorating supplies and when I came back they had moved everything over to the second one. I added the gloves and then took a picture. Then we re-dressed the first one. 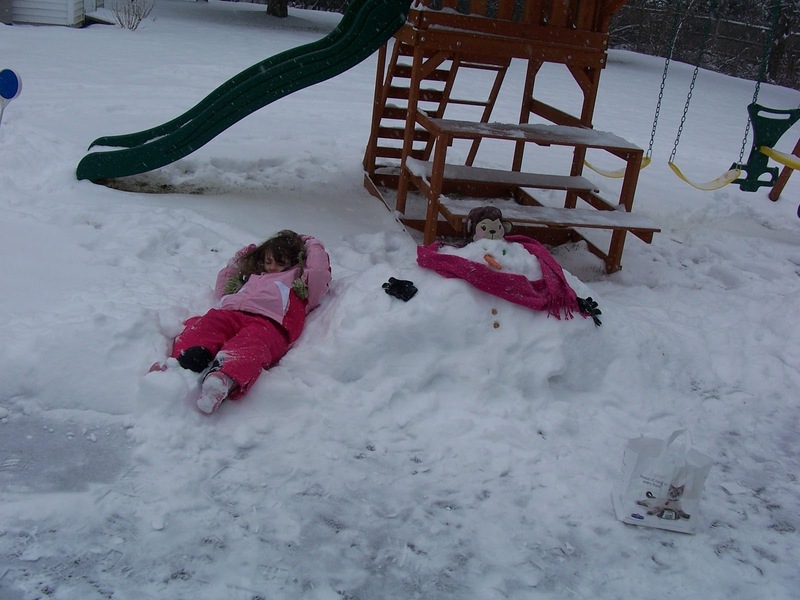 I asked Hazel to sit with her snowmen, but somehow she ended up laying down. Not sure what happened there. She also has been very concerned that her monkey hat (otherwise known as her George hat since she loves Curious George) is outside. She wanted to be sure it wouldn't blow away. The hat no longer fits her, but she loves it. Guess I better not pack it up for the charity drop off I need to do. By this time, Steve and I were getting cold so we made Hazel come in for some hot chocolate and lunch. 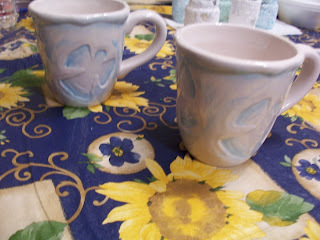 We had grilled cheese sandwiches and soup with our hot chocolate. The perfect lunch for after playing in the snow. Then amazingly she took a nap for us. Oh, and I have to share these cute mugs I bought ages ago and always kept for a day like this. This is what we had our hot chocolate in. Aren't they adorable? I bought them when I was single (and I have a matching plate) and always thought they would be perfect for hot chocolate after playing in the snow. On another note, please go check out our Sharing Saturday. I am having trouble keeping up with all the wonderful posts. There are over 130 last time I checked, and it is still open. So go over and get inspired and feel free to share your amazing ideas.